With very young players simply having the players stop, get balanced and shoot is a good starting point. When progressing to moving lay-ups, coaches should emphasize correct footwork and the ability to shoot with either hand. Spend a short amount of time on technique in each training session, and then give the players plenty of chance to practice. The player starts at the low “block” position facing the basket, the coach stands under the backboard, facing the player. The player takes one step and jumps to “high 5” the coach (they clap hands). The step is with the foot furthest from the baseline (i.e. 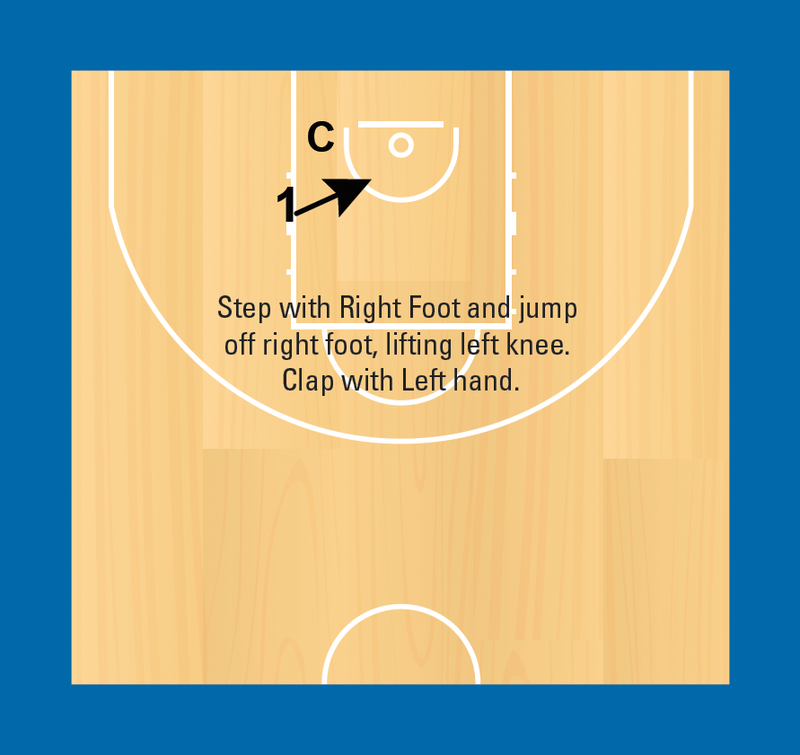 right foot when on the left hand side) and the player “high 5’s” with the hand closest to the baseline. When the jump they lift the knee and hand on the same side of their body. After a few tries, the player has a ball, stands in the block, takes one step, jumps and shoots. Next, the players start one step from the block. They take one step (landing in the block), a second step and then jump to “high 5” the coach’s hand. The first step is with the foot closest to baseline, the second step is the same as in the first stage above! After a few tries, give them a ball and let them shoot! Take one more step, jump and shoot. To continue with the teaching sequence, the players now need to dribble the ball! Have them start one step away from the block, dribbling the ball, whilst standing still. When the coach says go, the player takes two steps to the basket. The footwork is the same as stage 2 above – the first step landing in the block! Next, players start two steps from the block, standing still and dribbling the ball. Taking their first step while dribbling and then taking a second step, which lands in the block. They pick the ball up at this time. After the third step, jump and shoot. Finally, players start at the three-point line, dribbling the ball while standing still. They move towards the basket, focusing on landing with one foot in the block (baseline foot), taking a final step, jumping and shooting. They should catch the ball while their feet are in the air, landing in the block. Another progression is to have players run toward the basket, catching a short pass from the coach. They catch the ball with their feet in the air. They land with one foot in the block (left foot on the left hand side, right foot on the right hand side), land their second foot and then jump and shoot.